Last year I was semi-lamenting the fact that I didn't get a chance to attend my first rodeo. So with an impending move, I made sure to make it happen this year. Each March, Houston hosts one of the biggest rodeos and livestock events in the country. It's filled with carnival rides/games, fair food, livestock shows, rodeo competitions and concerts. I was excited for the culture shock but also for the cowboys and the carnival food. Cows were lassoed, steers were wrestled and actual cowboys rode bulls and horses for the long 8 seconds necessary to score points. I was super fascinated by the action on the rodeo stage (and intrigued by the names of the cowboys---there were several Codys, a Ryder and even a Roper). The abundance of cowboy boots, stetsons and fried food options was a little overwhelming. A normal day in Houston doesn't yield these encounters with Texan stereotypes so I found it pretty amusing to see them all at once. And for the food, well I was a little conservative with what I consumed. The idea of a fried concoction seemed to make my stomach turn. But I made sure to do some research beforehand to check out the must-eats of the rodeo. From Cowboy Kettle Corn was the 1st prize winner of the Most Creative award at the Rodeo's Gold Buckle Awards--Nitro Pop Popcorn. 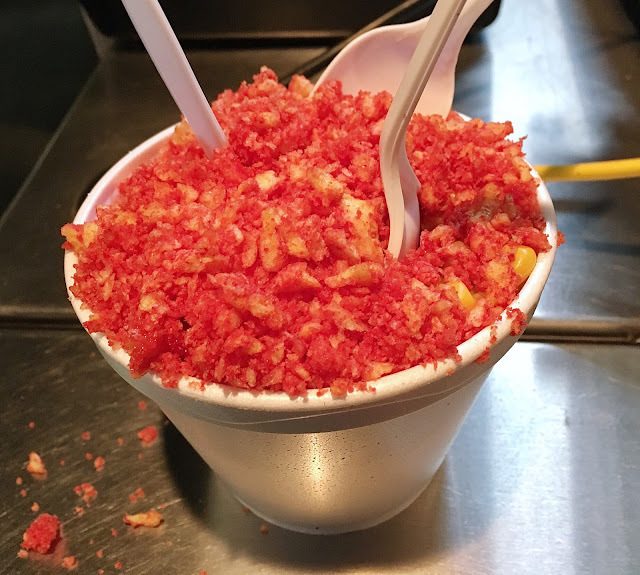 The brightly colored, fruit-flavored popcorn was doused with liquid nitrogen upon serving and each bite was literally like a breath of fresh air. With each salty, crunchy bite of popcorn, there was a burst of cold air. It was a delight to my senses of touch, sight and taste. Flaming Hot Cheetos were a favorite of mine in high school and when Erin told me her co worker thought the Flaming Hot Cheetos Corn from the rodeo was pretty tasty, I made it my mission to find this bright red corn bowl. It was pretty simple: a bowl of buttered corn topped with cheetos crumbs. The crunchy texture was nice but it wasn't too mind blowing and my friends and I thought we could easily recreate it at home. (for some reason I thought it'd be creamier and more decadent). The one thing I missed out on was Mutton Bustin. I ended up catching literally the tail end it. Mutton Bustin is the event for small children to have their chance to ride animals just like the cowboys. Pretty bummed I missed it but pig races were a close substitute and also this video of the event helped me feel better. So glad I got to see my first rodeo and could cross this off my Houston bucket list.